VW has bought, fixed more than half of polluting 2.0-liter diesels in U.S.
VW said it repurchased or terminated leases on nearly 238,000 vehicles. WASHINGTON -- Volkswagen Group said on Friday the company has bought back or repaired more than half of 475,000 polluting 2.0-liter diesel vehicles under a U.S. government settlement, just six months after it launched the largest-ever automotive repurchase offer. The world's largest automaker said in a letter to a U.S. judge overseeing the settlement that as of Wednesday, it repurchased or terminated leases on nearly 238,000 vehicles and repaired 6,200 after it admitted in 2015 to secretly installing software that let vehicles emit up to 40 times legally-allowable pollution levels. Under the agreement, Volkswagen must buy back or repair at least 85 percent of the vehicles by 2019 or face additional penalties. In March, VW pleaded guilty to fraud, obstruction of justice and falsifying statements as part of a $4.3 billion settlement with the U.S. Justice Department. The company is to be sentenced to three years of probation on April 21 by a federal judge in Detroit. Under a plea agreement, the automaker must make reforms and faces oversight by a yet-to-be-named independent monitor. The September 2015 disclosure that VW intentionally cheated on emissions tests for at least six years led to the ouster of its CEO, damaged the company's reputation around the world and prompted massive bills. In total, VW has agreed to spend up to $25 billion in the U.S. to address claims from owners, environmental regulators, states and dealers and offered to buy back about 500,000 polluting U.S. vehicles. It agreed last year to spend up to $10.03 billion to buy back the polluting 2.0-liter vehicles. In February, VW said it had spent $2.9 billion on buybacks. A federal judge granted preliminary approval in March to a plan for Volkswagen to pay at least $1.22 billion to fix or buy back a separate group of polluting vehicles -- nearly 80,000 3.0-liter diesel vehicles including some Porsche, Audi and VW SUVs. 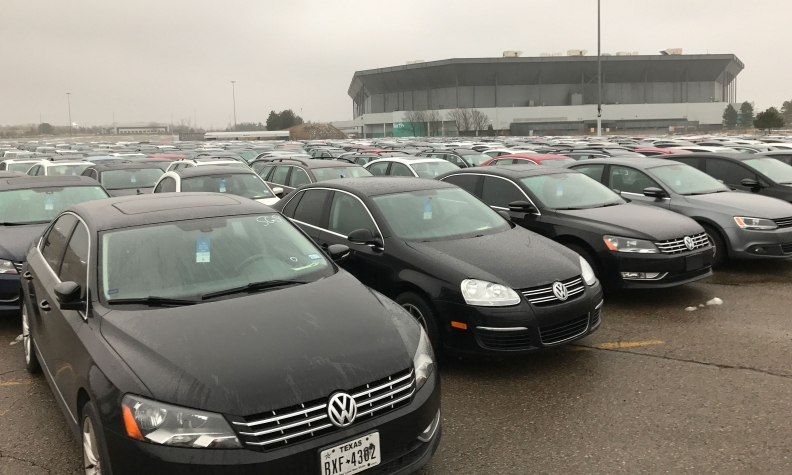 VW has offered to buy back 20,000 of those vehicles, but could have to repurchase others if regulators do not approve fixes. The 3.0-liter vehicles have an undeclared auxiliary emissions system that allowed them to emit up to nine times allowable limits. A judge will hold a May 11 hearing on whether to grant final approval to the 3.0-liter settlement.